As the Artist Contact with The Avenue for the Arts, I had the chance to sit down with Angela and get an inside look at her life, her studio, what inspires her and what she has in store for us at The Market presented by The Avenue for the Arts, June 9th. The Market presented by The Avenue for the Arts will be held on June 9th for ONE DAY ONLY! It will be from 12:00pm-9:00pm and be filled with local art, local food, local shops and a diverse entertainment lineup. We are still activly looking for artists, entertainers and volunteers! If you are interested please visit our website or e-mail us! The apple does not fall far from the tree when it comes to our first featured artist for The Market presented by the Avenue for the Arts. Angela Jones comes from a family of makers. She has always been a creative person and thanks to her parents, she was able to explore the world of imagination a lot earlier than most of us. Her mother owns her own hot shop called Heart and Soul Glass Studio and her father is the man with the torch, forging his own work out of metal. Fortunately, as the Artist Contact with The Avenue for the Arts, I had the chance to sit down with Angela and get an inside look at her life, her studio, what inspires her and what she has in store for us at The Market June 9th. Angela was born in Hastings, Michigan where her drive and love of art began to flourish. Her college career started at Kellogg Community College, where she is finishing up her Associates in Art with an emphasis in photography. Simultaneously, she is working full time in print media/graphics for a company in Middleville AND going to Kendall College of Art & Design part time for her Bachelors of Fine Arts. 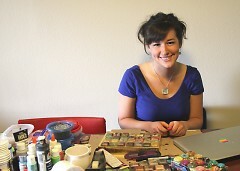 She is interested in many mediums, from photography to graphics to jewelry making. 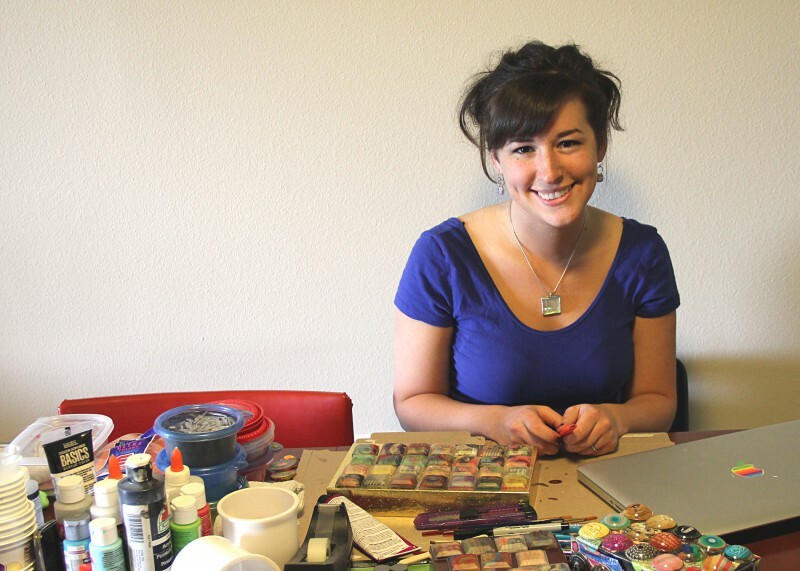 She laughs as she says, “At first, Kendall did not know where to put me because I work with everything!” She soon found a home within their Functional Art and Sculpture program. Not many can say they are as fortunate as Angela, being able to attend school while working full time. As if this was not enough, Angela just established her own website called Polyester Dress. When I asked her about her interesting site name, she replied, “Basically, Polyester Dress came about as a last minute username several years ago. It is a name of a song by The Icicles, which was my favorite song at the time. I just really related to it and I like how it sounds. If you’ve seen Donnie Darko, it is like my Cellar Door.” Her website is still under construction, but keep it bookmarked because she is a talented little bee and you do not want to miss this! She will have links to her photography, digital media and typography as well. 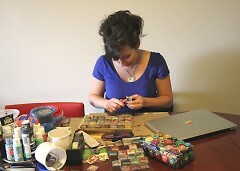 You can also follow her on other forms of social media currently such as etsy, facebook, twitter, flickr and tumblr. This will be Angela’s second summer with The Market and her booth will be packed with a versatile array of handmade gems. This will include jewelry, necktie purses, postcards, framed prints and treasure boxes. “I like making things that are functional and affordable, a little something for everyone,” she says. Her inspiration comes from “treasure hunting.” Angela loves to go thrifting, especially at Goodwill. 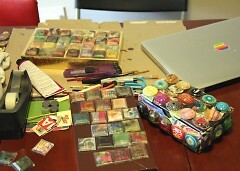 “I love making use of old treasures to find a new use for them and incorporate them into something wearable. I enjoy finding a use for an over abundance of things, too. Sometimes, if I don’t want the item, I will take a picture of it and it will inspire me to create something from it, for example if an odd shaped toilet seat comes along, I don’t want that in my house, I just want to keep the memory of it,” she laughed at herself. All joking aside, she really loves vintage items, such as fabrics, gadgets and any kind of interesting shaped treasures she might find.